Stress. In one way or another we all experience it. Just thinking about the word “stress” we are able to conjure up feelings of being overwhelmed, sadness, frustration - to name a few. Stress is defined as emotional tension or mental strain. For many of us it is an all too common of a feeling for us daily. High levels of it can bring about sadness and depression. We can feel dread that leads to anxiety. Some of us experience irritability and anger when we are stressed. Stress can lead to memory and concentration problems, mood swings, and compulsive behavior (think addiction; be it to food, alcohol, or drugs). Basically, stress wreaks havoc in our lives. The year is winding down and the holiday season brings its own stress with it, doesn’t it? When I look back at just this year, I can honestly say that the things that I worried about, that I lost sleep over, did not come to pass in the way I envisioned them. So why do so many of us live under a cloud of stress? Recently I read somewhere that worrying causing you to suffer twice if what you were visualizing comes to pass. Why punish yourself twice? 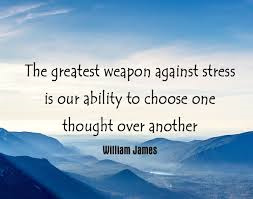 In writing this article I have done some research on stress and its effects on our lives and bodies (not that I don’t have first-hand experience mind you – but I was interested in what the experts had to say). The overarching theme to dealing with stress in all the research I’ve done is to keep everything in perspective. I believe most of us have the tendency to ‘borrow trouble’…envisioning what might occur if that happens then this will happen and then I will do/say this…we are three jumps ahead in a situation that may not even occur. Keeping perspective and being ‘in the moment’ is step one to dealing with situations that seem out of our control. 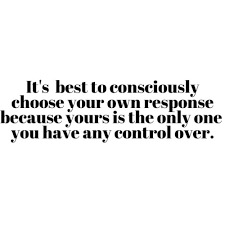 Situations that we encounter that seem out of our control lead us to the next step when we ask, “What do we have in our control?” Conquering those feelings of being out of control begins with taking a harsh look at what we do have in our control… We have control over ourselves, and our responses to situations and people. I can only speak for me. I am only responsible for me. Bottom line. If I do or say something that offends – only I can be blamed. If I fail to do something (here’s a big example: failing to file taxes on time) I only have myself to blame. Any angst I may feel is because of my action or inaction is all my own doing…all in my control. I suppose therein lies the rub. Procrastination and inaction lead to stress…the realization is that what I’ve done (or failed to do) is my own fault. Accepting responsibility and moving on is part of the process of eliminating unnecessary stress. A friend and I joke that Halloween comes around every year on the 31st of October. As mothers to little ones we would always find ourselves running around at the last minute for costumes, candy, pumpkins. It became a standing joke with us…like Halloween is a surprise every year. I share this with you because a little planning can go a long way. My migraine that has been with me for that last few days can be blamed on items I wanted to accomplish early this holiday season. As I look at my list (self-imposed) I realize that everything that I thought I needed to accomplish can be done another day. Here’s where perspective comes in. I have tried to recognize that when I am able to – stuff will get done. Recognize the signs of stress in your life, on your body. Are you having trouble sleeping? Are you getting angry easily? Feeling depressed? Saying “NO”… and establishing boundaries. The only person that is going to have the headache/migraine is me when I overload myself, therefore, I need to acknowledge that there are just things that I cannot do – no matter how much I want to. Give yourself permission to say “No”. Experts say that regular exercise can help us process stress easier. This morning I was thinking about that. I thought maybe instead of thinking I HAD to walk in order to bring my stress level down – I would think that taking a walk and enjoying the scenery would be a nice change (here’s perspective again). Taking care of our physical self is important in reducing stress. Taxing your body with overeating, drinking in excess or recreational drugs leads to an unhealthy brain which then lessens your ability to deal with daily stress. Maintaining a healthy diet and keeping your body and mind active can keep you focused. Finding a stress reducing technique that works for you is important. It could be yoga, painting, poetry, or nature hikes. What is important here is that you find something that helps you. Reducing stress in different areas of your life can help. You have to work (stress causing) but you don’t have to go to your class reunion (unnecessary stress), you don’t have to invite out of town relatives over for Christmas (lots of unnecessary stress), or you don’t have to forget to pay your car note (being unorganized can cause tons of unnecessary stress). Its also ok to admit when you need help. Its ok to turn to a spouse, relative, co-worker or therapist when you are feeling overwhelmed. (The same friend that jokes with me about Halloween being a surprise jokes with me when I tell her ‘I’m fine’. She calls it the bad ‘f-word’.) Prizes will not be given out for having a stiff upper lip and suffering silently. I look at it like this – life – on its own can be stressful. All types of stuff happens daily – from flat tires to broken windows, to car accidents and heart-attacks…we do not need to add to the unforeseen with our worrying and stressing about the smaller stuff.